Corona’s bloggers wrote 78 posts in 2012 on everything from trends in market research, to marketing strategy, evaluations, and nonprofit business models, just to name a few of the topics covered. So what were the most popular blog posts? 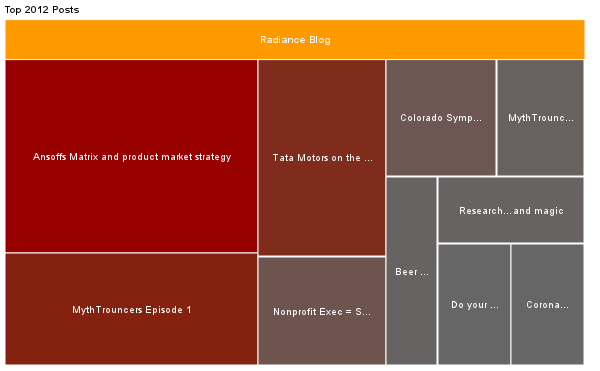 Above treemap shows popularity of each post by number of views. Size of area is proportional to the number of views among the top 10 posts. Seems like our readers are a diverse group. We have many ideas for more blog posts and content for the coming year. What do you want to see? To stay on top of the Radiance Blog, follow us on Facebook or Twitter where we post our most recent content, or subscribe to Radiance in your favorite RSS reader.